The best of our four day tour!!! This place is a gem... Pavel is very professional he proceeded with our tour even if he had some personal issues that he needed to attend to. We would not rush you and was very patient with all our request. Would recommend him to our friends.. Enjoyed the moderate hike we were probably not prepared for it but we enjoyed the viewpoints he took us. Our only comment is that you could’ve have informed us ahead of time that the castles were not open until summer time we could’ve decided to go on a different location because seeing the inside of the castles is what we’ve expected on this tour. Excellent walking tour. Pavel was waiting for us well before time, very knowledgeable and avoided all the crowded areas with great short cuts without missing any of the sites. We had a 7year child that enjoyed the walk as well so I would highly recommend this tour. Wonderful tour! Pavel was able to show us so much in a short time, but never rushed us. He patiently answered all the kids questions and showed them a really neat surprise in one of the libraries. We will definitely be back and will always use Pavel! Fantastic tour guide. Pavel was extremely knowledgeable about Kutna Hora and we even went to a local restaurant for lunch. His car/van was extremely comfortable and easy to get in and out of. I would book with him again! Pavel arrived promptly for the appointment. He was very knowledgeable and we enjoyed his company on our four hour tour of Prague. Pavel picked us up on time at hotel and I asked him if he wouldn't mind going to the Charles bridge first as we had not gotten there yet. A 2+ hour drive to Chesy Kromlov .A stop at the original Budweiser beer plant for a beer that they only make in the Czech republic. 10 minutes later we were in the fairyland atmosphere of chesy Krumlov. A gorgeous 13th century city . Pavel gave us a wonderful informative tour. Highly recommend him. English was excellent. Pavel came on time, gave us lots of great history and information, took us to extra places not on the tour but of interest to us, was kind, patient while we took pictures, was considerate and enthused about showing us around Prague. His English is excellent. We both highly recommend him and would not hesitate to book with ToursByLocals again. The tour was well worth the price and helped us get our bearings. He gave us tips on using public transportation. Thanks so much, Pavel! Pavel's English is good and his knowledge of the history is great. We were very comfortable in his van. And he did a great job to show us the town with as few crowds as possible. We recommend him highly. Pavel is a fantastic tour guide!! I have never seen someone know so much about their cities past! We booked him for a 4 hour tour, and we had such a great time. We actually went 1 hour over. Pavel didn't mind. What an awesome guide, and great guy! I highly recommend Pavel!! Thanks!! If you are looking for a private tour guide in Czech Republic.....look no further.....Pavel is your guy! Two "senior" couples spent the day with Pavel in Prague before embarking on our Danube River Cruise. Pavel is extremely knowledgeable, confident, funny, polite, professional, flexible - and a great driver! His English is perfect! We traveled to Kutna Hora with him and even though it was raining, it was a magical day! Upon our return to Prague, we toured Strahov Library and the Dripstone wall. This was our second time using Pavel to show us the sites. He is so knowledgeable about the city and took us on a great tour of the Old Jewish section of Prague. We visited all the Synagogues and the main cemetery. We also took in several museums on this wonderful walking tour. We enjoyed Pavel so much we asked him to have lunch with us during the tour and continued on afterwards with him. I highly recommend Pavel. It was our first time to visit Prague so we decided to book some tours. Pavel picked us up at our hotel and drove us around the city, making stops at key sites throughout our 4 hr tour. Pavel is a professional driver and knows his way around town. It was very hot outside, so being in his air conditioned van was so nice. He is an excellent historian. We learned a lot from him about Prague. I highly recommend this tour. We have booked him now for a walking tour of Prague. Good overall. I have had better. Pavel was accommodating and knowledgeable. We accomplished quite a bit in our half day -- learning more about the city, country, and their history than we could on our own and seeing spots we would have otherwise missed. The whole family enjoyed the tour and were grateful to Pavel. Pavel was a great guide, as someone who has lived in Prague all his life, he was able to shed a lot of light onto what we were seeing. We highly recommend him. Extremely knowledgeable and friendly. Great for older students looking for extensive understanding of Prague's history. The four of us had a very enjoyable and interesting tour of Prague with Pavel. His knowledge of the city and its history made our tour the best we have had with any tour guide. His choice of what we saw and timing to avoid the crowds was especially appreciated. I would highly recommend Pavel for an insightful and enjoyable tour. During our trip to Terezin, we found Pavel extremely thoughtful, kind and patient in answering our questions and explaining the history, location, and impact of this prison/transfer camp. We learned a lot from him and the local guide who spent time with us in the camp barracks. Would definitely recommend Pavel as a tour guide and to visit Terezin while in Prague. Pavel is personable and professional. He was very knowledgeable about the history of Prague which we appreciated. He was also flexible in honoring several special requests. I would recommend him to anyone visiting Prague. The Best tour we have ever had!! Pace was perfect and it was all inclusive. THANKS Pavel!! Spent the day with Pavel. We saw all the major sites and learned a lot about the history, architecture, politics, social, and economic culture of the city and country. Pavel also gave us many good suggestions for our remaining time in the city. Prague is a beautiful city, but it is spread out and rich in history so to truly appreciate what it has to offer requires someone as knowledgeable and passionate as Pavel. I highly recommend the tour! Wonderful, smart man and tour guide! We chatted well before the tour so he knew a little bit about our interests. We started right on time at 9:30. Prague's streets are mainly cobblestone--be prepared. So Pavel suggested that we take the tram up to the top to see the Palace and then we would walk down to the city. He showed us everything and was eager to impart his knowledge. There really is so much to see. Had lunch at a nice restaurant (outside) and got to know Pavel and Prague better. Bravo! Pavel is extremely knowledgeable, kind, fun and flexible. I highly recommend him! It was also easy to communicate with him before and during the tour. Pavel was an amazing guide. We truly enjoyed the time with him. The depth of his knowledge was impressive. He made our visit to be a memorable one. Pavel was an excellent guide. He was very knowledgeable about all aspects of Prague's history, politics, eating and beer establishments...I plan to to engage him him on my next visit to this area. A wonderful gentleman with superb language and communication skills. Pavel was easy to be with and had a great depth of knowledge. My rating is 4 stars solely because he didn't offer to go into places without my prompting. I finally realized it was because many places charge incremental fees to go in. We had no issue with paying for admittance to places worth seeing and would have missed a few if we had not realized his hesitation. Otherwise, he was great. Pavel is absolutely delightful, hugely knowledgeable, with a fun sense of humour and great company! If we were staying any longer we would definitely book another tour with him!! Definitely worth booking a tour with Pavel! Especially if you get the chance to get out of town in his luxury vehicle- the countryside is gorgeous and the little towns are so lovely to wonder about! Pavel was excellent! He is extremely knowledgeable about Prague, its history, architecture, stories, and people. He wove the information seamlessly in to a wonderful walking tour of the city. He is friendly, helpful, and lots of fun. He showed around the city - adding extra places and restaurants to visit later. My wife had an sprained ankle and Pavel tailored the tour to accommodate her mobility. We both thoroughly enjoyed the tour and would recommend him without reservation. We had a wonderful, well planned tour with Pavel. Pavel was an excellent tour guide. He is very knowledgable and gave us a lot of great information. I would not hesitate to book another tour with him. He picked us up promptly at our hotel, and dropped us off at great location for lunch & beer! Pavel was very knowledgable about history of Czech Republic, WWII, Holocaust and taught us a lot about religion in Czech republic. He was very welcoming and able to answer any questions we asked. He drove us from to/from Old Town, Terrezin and Kutna Hora. We felt extremely safe in his car the entire time and he made sure we were back in the city so we could make our next appointment. Very much so a personal tour and was able to accommodate all our needs. Highly recommend taking a tour with him! Pavel had excellent information about the history of the city. The pace was great—not too fast, not too slow. His timing was perfect—we were able to see the changing of the guards at the palace and the clock tower at the top of the hour. He was good with our kids and overall a pleasure to spend the morning with walking around Prague. I would highly recommend him and would use him again as a guide. Pavel was great! Very knowledgeable about all aspects of the tour and was able to answer any question I had in great detail. The tour was more than I expected and would definitely use him again! We had a great time! Saw and learned so much, thank you! Rating about Pavel was 5 out of 5. He was very knowledgeable and knew history inside out. It was a bonus he was a teacher and was very thorough in his explanations about every little detail that Prague had to offer. Thank you Pavel for a great time today. We thoroughly enjoyed it. We were a group of 8 adults who moved at different speeds and had different ideas of where to go. Pavel did a great job of meeting needs of each enough for everyone to be quite satisfied. We enjoyed our time with him. Pavel knew a lot about Prague and Czech history and was able to answer questions thrown at him randomly, stopped and answered so we all understood. We had a good time and learned a lot. 3rd tour in 3 days with Pavel. He's the most knowledgeable guide of all the guides on all the tours we've taken across Europe. Most pleasant and kind and fun to be with. We were blessed to have met him!! Cesky Krumlov is not to be missed. The beautiful gardens, the amazing views, shops and restaurants are just fantastic. Pavel took us on a very informative trip thru the town and along the amazing river. He took us to all the picture perfect spots we would have never found without him. He was the most perfect guide for a most perfect day!! My husband and I travel quite extensively. We love the in depth knowledge you recv from a tour but refuse to be part of a huge herd of people invading a city. We prefer the personal touch. Pavel is the most historically knowledgeable guide I've ever met. So personable, knowledgeable, informative and such a delight t speak with. We truly enjoyed our time with him. Pavel gave us such an amazing overview of the entire city, history and fun facts. I would HIGHLY, HIGHLY RECOMMEND Pavel for a personal tour. We really enjoyed our walking tour with Pavel! He provided us with a wonderful overview of Prague and the history of the city that set the stage for the rest of our visit to this beautiful city. He was very knowledgeable about Czech history and culture and shared stories of events that happened in different places. He also gave us valuable pointers on getting around the city. 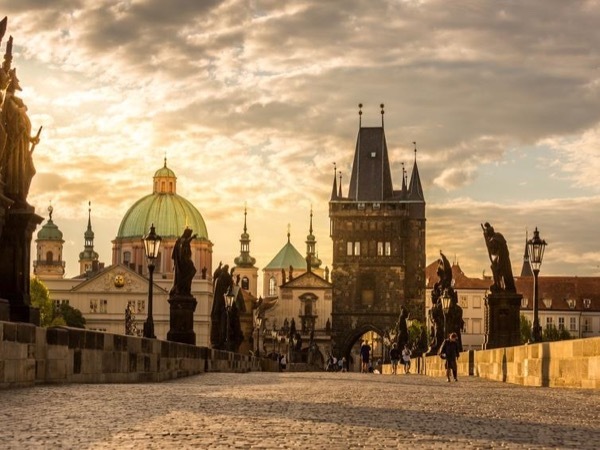 If you want to see the major sights of Prague at your own pace while avoiding crowds & learning fascinating facts, please take this walking tour w Pavel. Like an expert Sherpa, he led us through crowds & alternate paths arriving at each site at the least busy times -- all the while sharing his seemingly endless knowledge of history. Even better: he makes for great company & is a pleasure to spend time with. Pavel was a fantastic guide. He was knowledgeable on everything my curious kids could ask, was entertaining on every topic and conveyed his passion and enthusiasm for Czech history. Pavel took the time to help us plan out dinner that evening and an agenda for the rest of our trip. We cannot recommend him highly enough for anyone visiting Prague. Pavel was an amazing guide in Prague. He was patient with our many questions and took us to the most interesting places. He kept us on a pace that made the most of our time, yet allowed us to fully enjoy the sites we were seeing. He made us fall in love even more with Prague! We really enjoyed our tour with Pavel. We thought it was an excellent tour for our first time in Prague. He took us to many of the sights just before the bulk of the tour groups got there so we didn't have to fight the crowds. He answered all our questions & we found him very informative. He picked us up on-time at the place we stayed and his vehicle is very comfortable for up to 6 people. Pavel was terrific. He stepped in and took over when our guide had a last minute issue. He is fun and very knowledgeable. I would highly recommend him for any tour in or outside of Prague. Pavel was very professional and extended a friendly welcome and introduction to Prague. It was obvious that he has a very extensive knowledge of historical facts and ensured that we covered as much of the city as possible during our time together. Our tour was very successful and we would highly recommend him. Absolutely fabulous!! Pavel is a walking encyclopedia but presents his knowledge in a way that is always interesting. The half day deep dive into the history of this breathtakingly beautiful city was made even better by Pavel's nice personality. His restaurant recommendations were spot on and his local knowledge allowed us to avoid hour-long lines into sights. There is simply not better way of getting to know a city than Tours by Locals and Pavel was one of the most enjoyable guides we have ever had. TOUR GUIDE RESPONSE: Dear Karen,thank you very much for such a beautiful comment about me and my Prague walking tour.I realy enjoyed stay with your party.Warm regards from prague,Pavel. Pavel was fantastic...so knowledgeable and helpful. We took a day trip to Cesky Krumlov. He was so considerate and planned the afternoon on a very hot day so that there were stops for a great lunch, ice cream, etc. He knew special approaches to get away from the crowds and took me into shops that were not just tourist traps. He even helped me get a massage scheduled after the trip as my back and neck had been hurting from two weeks' traveling. He really took extra care and it was a great trip! TOUR GUIDE RESPONSE: Dear Terry,thank you very much for your wonderful comment about me and my Cesky Krumlov private tour. I wish all the best to you and your family and look forward to see you in Prague again.With warm regards from Prague,Pavel. Very knowledgeable tour guide, with a great car, but extremely tired, slow and quiet. Make sure to drink lots of coffee before the tour and ask lots of questions if you want to learn something. TOUR GUIDE RESPONSE: Dear Peter,thank you very much for great rating,nice words about me and my Prague walking tour. Warm regards,Pavel. Pavel very knowledgeable of History of Prague and all sites. He is friendly and helpful, suggesting traditional places to eat, what to visit on my own after tour. He enabled us to go through line-ups quickly, a real time saver. TOUR GUIDE RESPONSE: Dear Julie,thank you very much for your nice comment about me and my tour.Warm regards from Prague,Pavel. Pavel was an exceptional guide. He was very knowledgeable and gave us a great tour. He was a very good and safe driver. He knows the country and it's history very well. I would highly recommend him. TOUR GUIDE RESPONSE: Dear Robert and Robert junior,thank you very much for such great rating of my tour South Bohemia.It was my pleasure to be your private guide and driver.All the best to you,Pavel from Prague. Pavel was an exceptional guide. He was very knowledgeable about the city of Prague. He had many funny and interesting facts during the tour. He knew how to avoid the crowds and saved us a lot of time avoiding lines. He also knew the best restaurants to eat authentic Czech food. TOUR GUIDE RESPONSE: Dear Robert and Robert junior, Thank you so much for your sweet comment and it's good to know that you liked Prague as much! I'm looking forward to see you again! Best wishes from Prague! A five star experience...Pavel was knowledgeable,informative and was most pleasant..arrived on time to our hotel...had coins available for all WC usage"....looking forward to our tour with Pavel tomorrow..overall A GREAT DAY IN PRAGUE!! Pavel is extremely knowledgeable and friendly, with such a contagious passion to share the history of his lovely city! My husband and I had a great time walking around the town, learning about the city and their culture. The tour was well structured and thought out, and we felt like we really learned a lot in our time with him. Thanks for the memories Pavel, and we had a really great day! The best way to see Prague is to walk. I am glad that I got to have Pavel guide me around Prague, which in my opinion is one of the most beautiful cities in the world. We got to see so much walking around. This is my second trip to Prague but this walking tour helped me discover so many areas that I have never seen in my first trip. I hope to meet with Pavel again to see other sites of Prague and the Czech Republic. Our guide Pavel was excellent! The tour was both informative and comprehensive. We loved the detailed overview of the magnificent city called Prague. TOUR GUIDE RESPONSE: Dear Francine, Thank you very much for the great review! I had a great time with you and your husband as well!Look forward to meet you in magical town Prague again. All the best!Pavel. Excellent guide. Would strongly recommend!! This was the perfect tour for what we were looking for. We like to get an overview of a city before we explore and Pavel did just that. Very knowledgeable guide (and a really nice person as well) who obviously takes great pride in the quality of his tours. We highly recommend this tour (and tour guide). TOUR GUIDE RESPONSE: Dear Tom and Jeanmarie.Thank you very much for your nice comment and great rating about my tour. Enjoy your stay in Prague.Pavel. We had a wonderful day with Pavel! We enjoyed our ride to Terezin with him as he was so interesting and full of facts about The Czech Republic. The tour of Terezin was really informative, though very upsetting, it was important to learn about. Pavel has an easy, relaxed way about him, combined with all his knowledge, made the day a 10. Thank you Pavel! TOUR GUIDE RESPONSE: Dear Carolyn and your family.Thank you very much for great rating of my Terezin tour.Look forward to your next visit in Prague.All the best in 2017 to you and your beautiful family.Pavel Z. We had an excellent trip with Pavel. We were on a Christmas Markets Cruise that started in Prague. They provided a high level city tour and we wanted to supplement with a private tour. Pavel was wonderful. He had excellent knowledge of the history and was able to custom tailor a tour taking into account what we would see on the standard tour. He also gave us more of a flavor for the lifestyle in the city. We highly recommend Pavel and will use him again when we visit Prague next time. TOUR GUIDE RESPONSE: Dear Craig and Pattie,thank you very much for great rating of my tour.My pleasure to be with you and guide you in beautiiful Prague. Merry Christmas and Happy New Year.Pavel Z.
Pavel was an excellent driver and guide to Terezin. Pavel was very knowledgeable about the history of Terezin and shared valuable and interesting details along the driven and at the memorial. I would highly recommend Pavel for any of your Prague travel needs. TOUR GUIDE RESPONSE: Dear Kevin,thank you very much for your beautiful comment about my tour. I'm happy I met you all and had great time touring with you! Pavel. Pavel is an excellent Prague guide. His knowledge of the city's history and logistics made for a very enjoyable walking tour. I would highly recommend Pavel as your Prague guide. Prague visit. TOUR GUIDE RESPONSE: Thank you very much for your great comment.Glad to be with you and your party. Pavel Z.